Directed by Eric Wareheim, the clip was created as part of the YouTube Music Awards. “Famous” is the fourth single from “Sucker”, following “Boom Clap”, “Break The Rules” and "Doing It." 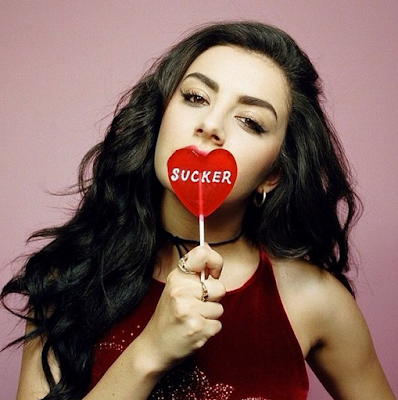 "Sucker" debuted at No. 28 on the U.S. Billboard 200 upon its release in December with opening week sales of 28,907 copies. Charli XCX just wrapped up a series of European dates opening for Katy Perry; she’ll launch a UK tour on Tuesday before heading to Japan, the Far East and Australia next month. Ariana Grande was a guest on The Tonight Show starring Jimmy Fallon on Friday. 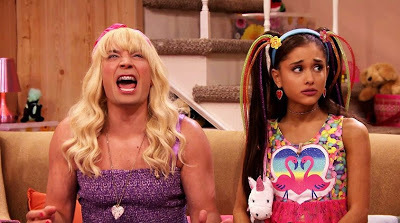 The pop star was on hand to appear in an “Ew” skit with the host before joining him for what the singer revealed is her first sit-down interview on a talk show. Fallon calmed the pop star down with his easy going manner, even managing to convince Grande to perform her impression of Celine Dion. Grande’s second album, “My Everything”, continues to dominate the charts with four singles issued to date; the record currently sits at No. 20 in the US Billboard 200 album chart.